The EFF has called for the immediate recusal of the secretary of the judicial commission into allegations of state capture, Khotso de Wee, after he was implicated in bribery allegations against Bosasa. 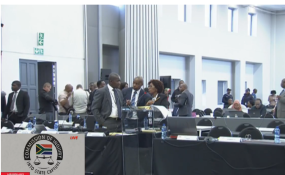 On Friday, News24 revealed that De Wee had been implicated in testimony before the commission by former Bosasa executive Angelo Agrizzi who has been delivering captivating evidence before the commission since Wednesday. Agrizzi will name De Wee as a recipient of cash payments relating to a 2008 tender awarded to Bosasa subsidiary Sondolo IT by the Department of Justice and Constitutional Development for the installation of security systems at courts around the country. De Wee was placed on special leave on Friday following the revelation. According to EFF spokesperson Mbuyiseni Ndlozi, the information was enough reason for De Wee to "fall on his sword". "The state capture commission should never be aided by nor composed of people who are implicated in any wrongdoing because they will undermine its integrity," he said in a statement. "The EFF is particularly concerned that the secretary of the commission also breached the security of the commission, thereby exposing witnesses to potential danger from people who are implicated. Furthermore, the secretary of the commission has not been honest and upfront on the costs associated with hiring the venue which the commission is using to conduct its work." The party has criticised the commission for using the offices of media company Tiso Blackstar, and in November last year wrote to Deputy Chief Justice Raymond Zondo asking for reasons why the building had been chosen to house the commission's sittings. "In his response, the DCJ (deputy chief justice) referred the letter to Dr De Wee and assured the EFF that the letter will be responded to. The EFF has not received any response on the reasons for using a Tiso Blackstar building and has not received the breakdown of how much is being paid for the venue and other services," Ndlozi said. "The latest reports about Dr De Wee and our genuine concern about him not coming out in the open about the operations of the commission are reasons enough for him to go. The EFF demands that he must go, and will pursue further actions if he arrogantly remains as secretary of the commission." The EFF protested outside the venue last year when State Enterprises Minister Pravin Gordhan testified. De Wee was not immediately available to comment when contacted on Thursday evening. News24 attempted to reach him again on Friday morning.